I am not a fan of the wind. I’m not talking about the more romantic notion of a gentle breeze on a summer’s day that brings relief from the heat or whispers through overhead branches. No, I’m talking about the kind of wind that rearranges carefully arranged hairstyles, that wraps the laundry around the clothesline, that dumps plumes of red dust on my car and my windows, that sets off the sensor lights at the front door, which in turn sets off the dogs, that roars up and down the side of our house and whistles through cracks and crannies – you get the idea. I am not a fan of the wind, but I have to stop and consider the reality that wind is a strong metaphor for the Spirit of God. The coming of the spirit was accompanied by a sound like the rush of a violent wind. Some years ago, I attended a retreat at Queenscliff. It was winter and the weather was stormy. When I ventured out, I did so with lots of layers – hat, coat, scarf, gloves. On one occasion, I rugged up to go outside to walk the labyrinth. The wind was roaring, chilling my face, biting my nose and ears. 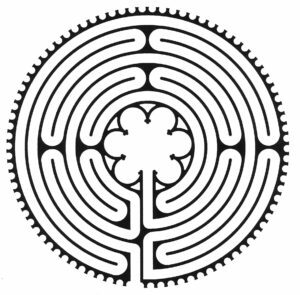 If you’ve ever walked a labyrinth, you’ll know that it twists and turns back on itself as you make your way into the centre, so one moment the wind was full into my face, the next it was pushing me from behind. 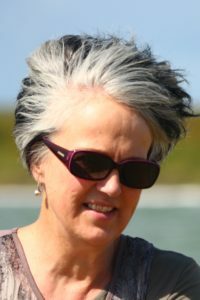 At first, I persevered – I ducked my head, buttoned my coat up higher, held onto my hat and tried to keep my scarf up around the lower part of my face. But, there came a point where I decided it was too much, I would give it up rather than fight the wind and that’s when I heard very clearly, not a voice from heaven, but in my spirit, ‘turn your face into the wind’. My first response was, ‘I don’t think so’, but the sense of the message was so strong that I eventually lifted my head, took off my hat and let the wind blow. That’s when I remembered that one metaphor for the Spirit of God is wind. God is in the wind. Later, I walked the beach in this wild weather. The water was choppy and grains of sand stung my face, both kicked up by the wind. The tide was coming in and as I walked, the breaking waves washed away my footprints. At the time, there were a number of things happening in my experience which I knew would bring turmoil and change that I didn’t want it. But walking in the wind – first the labyrinth and then the beach, reassured me that the Spirit is in the wind. Together, we would weather the coming storms. On the day of Pentecost, the first sign of what was happening was the sound like the rush of a violent wind. The inclusion of the word, ‘violent’ in this description tells us that it wasn’t a comforting sound. When the Spirit comes, the experience is not always comfortable. Sometimes, a violent wind rearranges our carefully arranged lives, chills our faces and strikes fear into our hearts. Sometimes we are confused and amazed and perplexed so that we want to deny movement of the Spirit. We may even want to simply say ‘no’, or to explain it away. 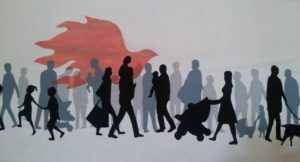 Pentecost invites us to open ourselves to the holy in-breathing of the Spirit of life in whatever way the Spirit comes. 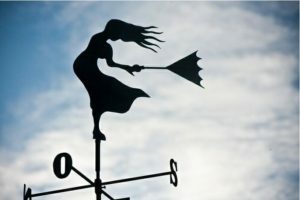 Despite my dislike of the wind, I want to be ready to give my ‘yes’.